Searching for the best standing desk for your office? Start here. What is an Adjustable-Height Standing Desk? An electric adjustable-height standing desk is a desk typically powered by precision linear motor drives that easily changes height with the press of a button. They have a distinct advantage over most manually-operated desks in speed, convenience, and performance, but tend to cost more than their crank-operated cousins. 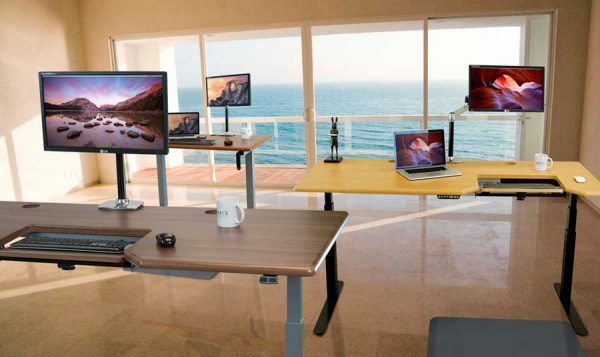 Nevertheless, they remain the active standing workstation of choice for homes and offices across the country. With dozens of adjustable standing desks spanning a wide range of capabilities, feature sets, and price tags, you can be sure to find a model that works for your unique workspace. With the sheer number of standing desks available, it can be pretty daunting to find the right desk. That’s why we’ve done the leg work and compiled the specifications of every standing desk we’ve reviewed. This page provides an apples-to-apples comparison of the different products in the market today and is a great place to start your search. As we explain in our Standing Desk Review Criteria, we look at a number of qualities and attributes when creating our product reviews. These include weight capacity, lift speed, stability, noise, ergonomics, customizable options, and assembly. To learn more about our review process in general, visit our Anatomy of a Review primer. Since price is often the first qualifier most prospective adjustable height desk users think of when desk hunting, we divided electric standing desks into three tiers, based on their price tag. In response to reader demand, we’ve also created a separate round-up of reviews just for Standing Desks Made in America—worth checking out if you’re looking for the very best-engineered and best-produced standing desks with the longest warranties and optimal customer support. As you might be wondering, yes there are also standing desks available for corner and cubicle denizens. We have grouped these separately in our comprehensive round-ups of Corner Standing Desk Reviews and L-Shaped Standing Desk Reviews. Click here to learn the difference between corner desks and L-desks. Below, you’ll find abstracts of each product review by category. 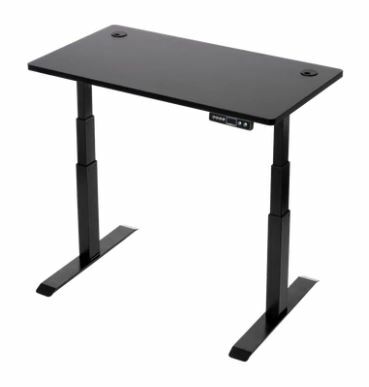 Note, we also have corner standing desk reviews, but as there are so few models available as yet these are not represented as their own group in this comparison review. Uncompromising in their features and capabilities, a premium standing desk should offer the best that money can buy. 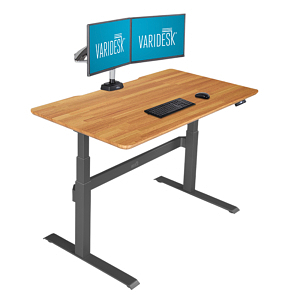 Nearly every adjustable height desk in this price category includes a digital hand controller and many come equipped with advanced safety and reliability features that give them longer warranties than the average. Not just the most functional, these stand up desks tend to have the best aesthetic as well. Thicker tabletops with beautiful finishes abound in this space, and you can also find hardwood and bamboo tops here. Of course, even among the high-tier desks, there is a wide range of quality and price. But beware—high price and high quality don’t always go hand in hand. Pros: The Lander is the most revolutionary standing desk design we’ve seen in years, with two features that set it clearly apart from the rest of the field. The first is that it arrives almost entirely pre-assembled, and comes together in just minutes without tools. The second is that in place of the conventional hand controller with an array of buttons and segmented readouts, the Lander’s height is intuitively controlled with just a tap on its height adjustment paddle. A double-tap will take the next to its next “favorite” height. The paddle has a multicolor hi-res display and a Bluetooth link to any smartphone, allowing you control the desk and access its built-in health coach using either the phone or the paddle. Made-in-America like all iMovR electric desks, comes with iMovR’s industry-leading ten year warranty, ultradurable and gorgeous 3D-laminated surfaces, and a plethora of size and color combinations, as well as the option of a built-in SteadyType keyboard tray. Recently, iMovR added another 36 color options in ultra-premium solid natural wood. Our top choice for taller users and treadmill deskers too, as the Lander’s impressive height range is matched with incredible work surface stability. Cons: Corner models are not yet available. For those see iMovR’s Freedom line, the Energize and Cascade models. However, iMovR has recently released an extraordinary array of innovation-leading L-shaped Standing Desks based on the Lander. Cons: The other side of the Varidesk brand name is inflated price, and the ProDesk 60 Electric is no exception. At $995, it is simply outclassed by competitors with made-in-America desks, much less competition from China (where this desk is made). The outdated “knee crusher” crossbar is a no no for a standing desk in this day and age, and the lack of customization options (only one size is currently available) means you won’t be able to customize it to ideally fit your space. Pros: The RISE was the first true sit-stand-walk adjustable standing desk we discovered here at WorkWhileWalking (apart from the aging travesty that is the Steelcase Sit-to-Walkstation). Highly width-adjustable and built to last, RISE desks are quiet and heavy lifting – only iMovR desks can boast a lower sound signature and higher lift capacity. Conference table-thick 1.375” tabletops are highly durable and add some extra stability. Cons: With an 83″ long top and the desk elevation set up all the way to the top there can be some significant lateral shaking in the desk. Shorter table tops and lower elevations are solid but basic physics apply here as they would to any desk of this width and thickness (i.e. weight) set to the extreme high position. RISE doesn’t seem to be quite ready for retail. Recent trouble with warranty returns and excessively long delivery times has led to some drops – RISE is down two editorial stars, and is no longer offered through any retail stores, to our knowledge. Cons: Despite being one of the first kids on the block GeekDesk is today a boutique-y, lifestyle manufacturing company that has not stayed on top of its game, and lacks the vast array of color and size options and the adjustable-width bases that other manufacturers now offer. Assembly takes longer than most other desks. The crossbar is necessary for lateral stability but can be a bit of a knee crusher for the individuals with long legs. It’s the turtle of the pack, with a lifting speed of only 1.1″ per second, compared to the speedy 1.5″ – 2.0″ per second of its competitors. Persistent production delays usually mean the desks can take as long as five to eight weeks to arrive, longer than most people are willing to wait. Mid-tier standing desks offer the best combination of features and value. More function than form, these desks may lack some of the bells and whistles of the fancier desks on the market: their table tops may be thinner and less exotic, and their electronic controllers may be simpler two-button devices. But make no mistake, these adjustable height desks give you the most bang for your buck and can handle nearly anything your workday can dish out. They come in a variety of sizes to fit any office environment, and most come with hefty lifting capacities upwards of 300 lbs. Pros: 100% American-made quality, built-in SteadyType™ ergonomics, PerfectPaint glide system, easy assembly (as well as a factory pre-assembly option), low cost, extra base color options (black, silver, and white), industry-leading warranty, extremely quiet operation. Also comes in eight varieties of standing corner desk models. Cons: Users over 5’11” should upgrade to the XT base (+$75) for extra height range. Note: users over 6’2” can also add 6” height extenders (+$59) to the XT base, a very popular option for extra-tall users that is only offered on iMovR electric standing desks. SteadyType™ removes desk space for the rare user with lots of paper flow. Pros: All the benefits of the Cascade minus the SteadyType™ keyboard tray. Comes in even more custom tabletop size options, including 24″ and 30″ depths, and 3/4″ and 1-1/8″ thicknesses. Also available in eight varieties of standing corner desk models. Cons: For those over 5’11”, upgrading to the XT base (+$75) will deliver extra height range. Those over 6’2” can add 6” height extenders (+$59) to the XT base, an option only available on iMovR electric standing desks. For treadmill desk users especially, there is not the ergonomic benefit of the SteadyType™ keyboard tray. Pros: The Uprise is Ergoprise’s newest line, an improvement over their aging S2S model. It is quieter and stronger than a number of desks on the market, clocking in with a 42 dB noise signature during adjustment and a rated lift capacity of 360 lbs. The base adjusts at a rate of 1.7″ per second, faster than the majority of desks out there. Cons: Everything above the Uprise’s base is plain-Jane. Its standard, high-pressure table top isn’t as durable as 3D lamination and is susceptible to moisture damage and delamination. Bamboo tops are available for the Uprise, but the added cost would put the desk well above the mid-range category. Pros: The Mod-E is the fastest adjustable standing desk in the West, with a 2.0 inch-per-second transit speed. Cons: The Mod-E only comes with a simple up/down controller. It’s also on the louder end of the desk noise spectrum, and at 75dB sounds like a coffee grinder during adjustment. A low max height of 47 inches may be too short for taller deskers and most treadmill desk users. Made in Malaysia, the Mod-E’s tabletop is not of the most impressive quality, and its design is somewhat dated. Pros: The Jarvis is a low-cost adjustable standing desk with a decent warranty. It comprises a commodity Jiecang base which normally exhibit poor performance stats, but uses some customized components that – according to the company – give it better stability than the stock base product. See also our reviews of the Jarvis L-Shaped Standing Desk. Pros: The UpLift adjustable standing desk is low-cost, and features a digital controller with four memory presets. 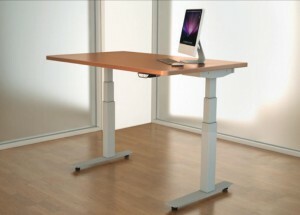 See also our reviews on the UpLift L-Shaped Standing Desks and the UpLift “Curved Corner” Standing Desk. Pros: The v3 is a simpler but more affordable variant of the GeekDesk Max. It has decent specs, available in three desktop sizes. Its 275 lb lift capacity is capable, though not as beefy as its high-tier counterpart, or even other mid-tier competitors for that matter. Cons: The v3 shares the painfully slow adjustment speed of its more expensive counterpart, coming in at 1.1″ per second. Its 48.75″ max height is fine for standing, but both taller users and those moderate height users on office treadmills may be challenged by this limitation. The design is somewhat dated, lacking, among other things, an adjustable-width base. Bargain desk hunters will find the cheapest deals for their sit-to-stand offices here. Budget adjustable standing desks come with small price tags, sometimes cheaper even than standing desk converters. While this price tier includes a small number of desks that perform adequately, many cost-reduced desks lack in performance in one way or another. Buyers shopping for the lowest priced deals should be especially mindful of the possible compromise on quality. Pros: Simple product, simple buying process. Limited desktop choices still offer a sufficient range of options for buyers who aren’t trying to match a specific decor or space. Vanity tops like natural wood or reclaimed wood are half the cost of what Fully and Human Solution charge. Ten year warranty is better than offered on any other Chinese-made base. Nice looking full-color manual with clear instructions for how to clear error codes. Cons: Weaknesses in crossbar design lead to instability with very large desktops and for taller users. Warranty does not include desktops. Assembly is quite involved, as it is with most any Chinese base that arrives as an “IKEA kit.” Specs say it’ll lift 400 lbs but we encountered numerous faults just trying to lift 355. There is a slight sync problem between the left and right motors that causes the desk to wobble every time it starts to ascend. 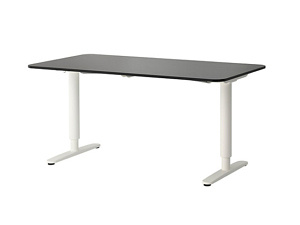 Pros: A step above earlier SmartDesk models, the First Class uses more reliable linear actuators (desk legs) and electronics from Taiwan. Assembly is about 20% faster than other SmartDesk models, and it looks to be faster, quieter, and stronger than their other standing desk products. Cons: Still a commodity product made as cheaply as possible—not deserving of a “premium product” classification. Only 1 desktop size and 2 colors options for the desktop and base, so it could be difficult to match to your desk to your office decor. Pros: A constant companion in college dorms and budget-conscious homes, Ikea aims to make the sit-stand office as affordable as possible with their adjustable-height Bekant. 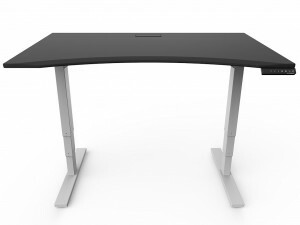 The desk manages to come in at $489 and offers a 10-year warranty. If your office furniture is IKEA brand this desk would fit in well with the rest of the decor. Cons: The Bekant’s low cost comes at the expense of unimpressive stats: its 154lb weight capacity is eclipsed by most desks, even manually-operated desks, and its low max height of 48″ makes it less than ideal for tall users or treadmill desk use. For a few dollars more you can get a much higher caliber desk from a manufacturer that specializes in these products. Overwhelming consumer complaints of early failing product. Pros: The good news is the Autonomous SmartDesk is cheap – really, really cheap. It also has an AI option that will act as your personal assistant, (albeit a very limited personal assistant compared to the Amazon Echo, for instance). Cons: Unfortunately, it’s cheap in both ways, cost and quality. We’re concerned about stability, reliability of the motors, and durability/appearance of the tabletop. The company is notoriously late with deliveries (customers’ stories of paying five to six months before receiving the product are not uncommon), and the ergonomic “cutout” version is hardly ergonomic and awkward to stand inside of. It takes just a little more to get something of far better quality. Consumer complaints on public forums number in the hundreds while only curated “5-star” reviews are published on Autonomous’ website. Don’t miss our comprehensive round-up reviews of Corner Standing Desks and L-Shaped Standing Desks, as well as our selected round-up for American Made Standing Desk reviews.